Today's letter – H - will be a discussion of a very important feature on a boat. Which of course, on a sailboat, has an entirely different name. Why, you may ask, is the bathroom called 'the head'. Well, the reason is just as gross as you can imagine. 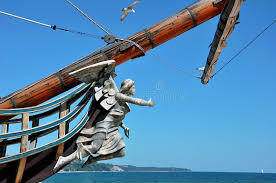 It seems, in days of yore, the 'facilities' were placed in the very very very front of the boat, the beakhead where the figurehead of the boat attached. Holes were cut in the floor, just above the water line, thus allowing normal wave action to clean away waste. Our fixer-upper has a 'head' of sorts. It is actually a port-a-potty which sits in a tiny alcove which is also home to numerous ropes and the companionway doors when they are not in use. It's not unhandy as one of the hooks for the ropes can also double as a toilet paper holder. It was completely UNHANDY in the fact that the port-a-potty which came with the boat leaked. It took me two nights, two soaked bathmats, and two pairs of wet socks to figure this out. 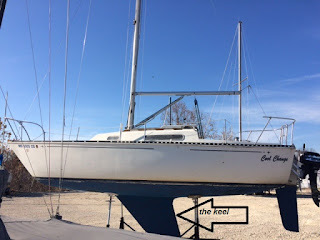 There is nothing worse than a leaking port-a-potty, not even the bucket with a trashbag which acted as the head on our Key Largo sailing trip. Except maybe a rental boat with a port-a-potty which wasn't cleaned as promised so that everytime the boat heeled the potty leaked until that one big heel which sent everything below deck flying thus flooding the floor with random...liquid...resulting in my favorite pair of tennis shoes being renamed 'the pee shoes'. The fixer-upper's port-a-potty is now residing in a landfill in Southern Missouri. My NEW non-leaking port-a-potty is most likely in Walmart's warehouse. H is also for Heeling. When a boat 'heels' it leans or tilts toward the water, due to the wind power. 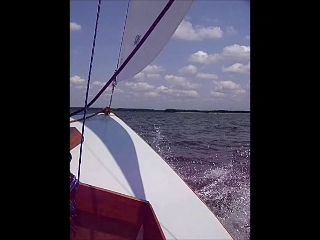 The heel is controlled by the keel and ballast and the finese of the sails. On our wooden boat, the keel is known as a daggerboard. It is adjustable so we can move it up and down depending on the force of the wind and how much we want to heel. This generally is my job. 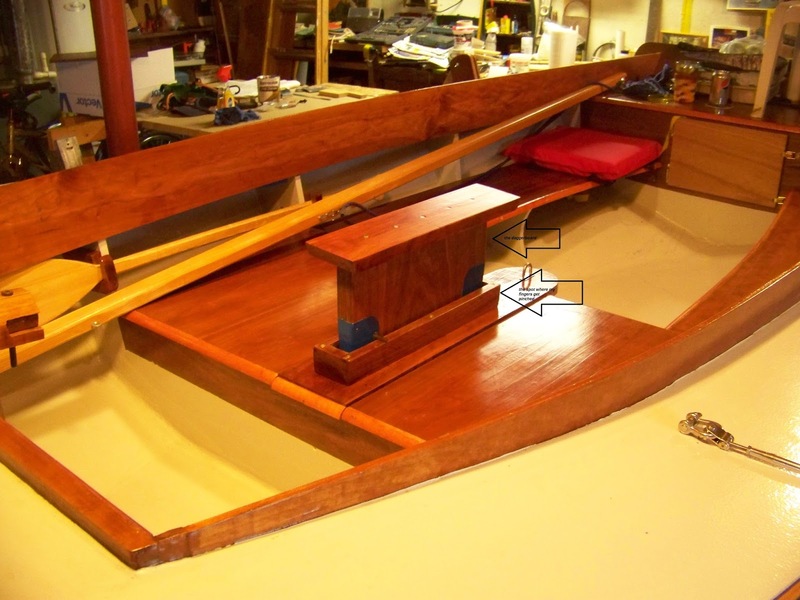 It is not easy but in order for the daggerboard to move up and down it must fit through a hole which I always manage to pinch my fingers in. Oh, and water likes to squirt out of it. Me, as the ballast, will move from the low side to the high side of the boat to balance the weight. 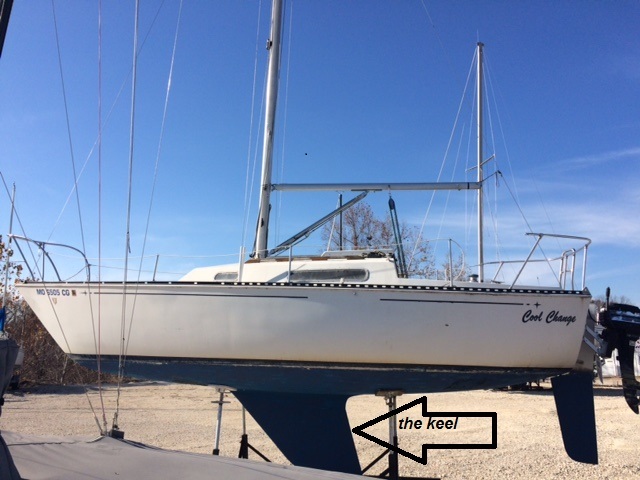 Our fixer-upper is a fixed keel which means we can not raise or lower it. It is made of lead, adding to the weight or ballast allowing for more stability. However, the weight of the people onboard affects the stability so a certain amount of care still need to be made to keep the boat balanced. And not hurt anyone's feelings what with being called 'ballast'. If a boat heels too much, it can capsize. just to be fair, this is also not a boat. it is a golf cart. I think we need a new word for his gross that hazmat spill was!! 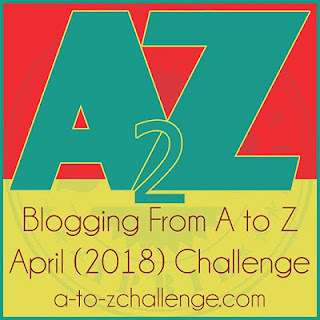 Great post, I learned something and laughed! More reasons why I don't sail or go boating. I have never been good with different languages unless it is about food. oh Haralee! You should really give sailing a try. even with all the oddball stuff it is just the best. I think my days of adventure are way over. My normal life is adventurous enough, thank you. oh no! never say never!! We once took a teeny, tiny airplane ride to the Aran Islands in Ireland. Each of the 8 passengers had to be weighed before boarding so they could distribute the weight evenly. "Heeling" on an airplane would be a really bad thing. Hopefully you will not need to resort to weighing your passengers! Oh no! There is no heeling on airplanes!! And there will never be a weight based seating chart on the boat! !